Here’s a rough and tumble bio on Judd that was heavily “borrowed” (i.e. plagiarized) from Wikipedipa. The much better and extensive bio is available on Wikipedia. That’s if you like that sort of thing. We really do. You want to know about ocelots? BOOM. Ocelots! Did you know that Salvador Dalí frequently traveled with his pet ocelot Babou? Me either. Judd landed and grew up in Dix Hills, New York.‪ He graduated from high school in 1988 and entered the University of Michigan, Ann Arbor’s School of Art, intending to emulate his cartoonist heroes, Garry Trudeau and Berkeley Breathed. His comic strip, “Nuts and Bolts“, began running in the school’s newspaper, the Michigan Daily, in his freshman year. In his senior year, through the University of Michigan’s mentor program Judd was taken under the mighty wing of cartoonist, juggernaut and supremely good egg, Cathy Guisewite of the comic strip CATHY. Cathy provided advice and introductions which lead to Universal Press Syndicate, which syndicates strips such as Doonesbury, Calvin & Hobbes, and yeah, CATHY, offering Winick a development contract. Development only lasted a year, and UPS decided not to syndicate Judd’s strip. Weeping ensued. Judd applied to be on The Real World: San Francisco, and was accepted as a cast member on the show in January 1994. Weeping ensued. To say the least, both living with and becoming friends with Pedro and meeting Pam who he shares his life with THE REAL WORLD was a seminal experience for Judd. In August 1994, just months after the show completed filming, Pedro’s health began to decline. After being hospitalized, he asked Winick to substitute for him at a national AIDS education lecture. When Zamora died on November 11, 1994, Judd, Pam, Pedro’s family and his partner Sean were at his bedside. Winick would continue Zamora’s educational work for some time after that. POST REAL WORLD, work and stuff. Judd did cartoons for over 300 of The Complete Idiot’s Guide to… series of books. Judd finally got syndicated with CREATORS SYNDICATE for his comic strip FRUMPY THE CLOWN. But while toiling away on the strip and the IDIOT’S GUIDES, Judd felt himself gravitating to a bigger story. After touring the county and lecturing about Pedro, Judd felt that Pedro’s story needed to stay out there. With that, he created a graphic novel. Pedro and Me: Friendship, Loss, and What I Learned, was published in September 2000. 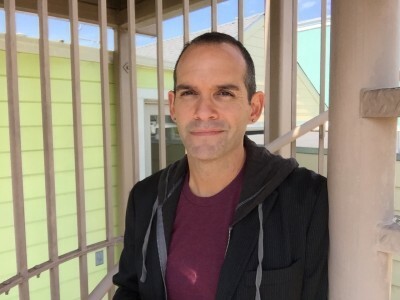 It was awarded six American Library Association awards, was nominated for an Eisner Award, won Judd his first GLAAD award, has been praised by creators such as Frank Miller, Neil Gaiman, and Armistead Maupin, and has been incorporated into school curricula across the country. After the memoir Judd moved into more humorous territory with The Adventures of Barry Ween, Boy Genius, about a cynical, seriously profane and potty-mouthed grade school whiz kid, who invents a myriad of futuristic devices that no one other than his best friend knows about. In 2001, Judd began writing what would become a ton of superhero comics. Such titles as GREEN LANTERN, GREEN ARROW, EXILES, STAR WARS, OUTSIDERS, BATMAN, SUPERMAN, POWER GIRL, THE JUSTICE LEAGUE INTERNATIONAL, CATWOMAN and more, leading to much acclaim and more than a bit of controversy. In July 2012 Judd announced an original graphic novel called Hilo (pronounced “High-Low”). The full color series, whose tone and visuals Winick describes as “part E.T., part Doctor Who, part Peanuts and Calvin and Hobbes“, stars a small town boy named D.J. whose life takes an unexpected turn when a mysterious boy named Hilo falls from the sky, and takes D.J. on adventures that include robots, aliens and a quest to save the world. It will be published by Random House, with the first book of six will be published in September 2015. Judd created an animated TV show named The Life and Times of Juniper Lee in 2005, which ran for three seasons on the Cartoon Network. Judd wrote the screenplay for Batman: Under the Red Hood the direct to DVD animated feature for Warner Premiere in 2010. It was based on the 1988–89 story arc “Batman: A Death in the Family” and the 2005 “Batman: Under the Hood” story arc that ran in the monthly Batman comic book series by DC Comics, the latter of which Winick had written. Judd was the head writer and a producer on The Awesomes, an animated superhero comedy series created by Seth Meyers and Mike Shoemaker for Hulu for the first 2 seasons and a consulting producer for the third. Judd lives in San Francisco with his wife (and fellow former Real World SF cast member) Dr. Pamela Ling, and their two children. They have far too many toys for grown people, a cat that speaks, and a sizable artificial lawn. Now, go buy Hilo and some super hero trade paperbacks. That fake lawn was expensive.